Today, I have gathered the developers involved in Star Fox 64 3D. 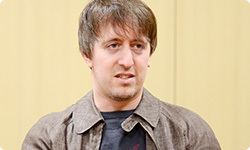 Dylan-san, would you please introduce yourself? Sure. I’m Dylan from Q-Games.1 I founded a company ten years ago in Kyoto. Fast forward, and I’m director of Star Fox 64 3D. Before that, I made Star Fox Command .2 (Editor’s note: Dylan Cuthbert was speaking in Japanese during this interview and his comments have been translated into English by Nintendo.) 1. Q-Games, Ltd.: A video game developer established by Dylan Cuthbert and others in 2001. Head office: Kyoto. 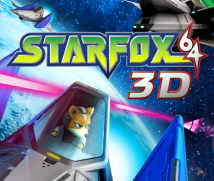 The company developed Star Fox Command for the Nintendo DS system and has also developed Nintendo DSiWare software such as Digidrive, Trajectile, Starship Defence and X-Scape. (Editor’s note: These titles were released in Europe as Art Style: Intersect, Reflect Missile, Starship Patrol and 3D Space Tank respectively.) 2. Star Fox Command: A strategy and 3D shooting game released for the Nintendo DS system in Japan in August 2006. Going back a bit, you were also involved in development of the original Star Fox3 for the Super Famicom. 3. Star Fox: A shooting game released for the Super Famicom system in 1993. The first game in the Star Fox series. This was released in Europe as Starwing . That’s right. Going even further back, about 20 years ago, I came to Japan from England for the first time. That was 1990. You came to lend support as a programmer for Star Fox. I was 18. 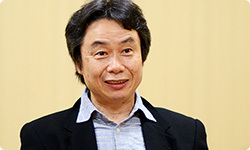 I remember asking Miyamoto-san how old he was. The next thing I know, I’m about the same age that he was then. You’ve got a lot ahead of you. Yes. (laughs) The first time I came to Kyoto, I was only here for one week, but it was really interesting. What was your goal during that week? There was a 3D game for the Game Boy system. Oh, you mean X .4 4. X: A 3D action-shooting game released for the Game Boy system in Japan in May 1992. It was never released in Europe. That’s right. I was in charge of making X. I was working for a company named Argonaut Software5 and came to show Nintendo a 3D engine I had worked hard on. I came with a colleague. When they showed us into the meeting room, about 30 people all wearing the Nintendo jackets (uniforms) filed in. I thought, “Uh-oh…” (laughs) 5. Argonaut Software Ltd.: A British video game developer that developed a 3D engine. Currently Argonaut Games PLC. Everyone was incredibly interested in the engine you had made. Yes, but I was nervous. But my impression of Japan, especially of Kyoto, of this town, was great. It suited me and I thought I wanted to work in Japan. What did you like about Kyoto? The people were great. Everyone at Nintendo was friendly. During that one week, we ate together at all kinds of places, which to me as an 18-year-old was a lot of fun. The food in Kyoto was good and the people were nice. Yes. And I had come from London, where it’s always raining, so Kyoto seemed incredibly bright. It was great. Maybe you came in the right season? In July, the rainy season would have just ended. It’s the feeling of subtropical Asia. My impression of Kyoto was really great, so I wanted to work with Nintendo. Hearing about those days is fun, so I’d like to ask a little more. Miyamoto-san, what was your impression of Dylan-san when he was 18 years old? I was surprised that he could handle programming at that age—that he could perform this kind of role when so young. I thought, “Oh, so that’s what kind of world this industry is.” The first thing I thought when I met Dylan-san was that this isn’t a field in which you can only get recognition by being older. He was able to make 3D games—which were cutting edge at that time—at only 18 years old. Right. You really wanted to learn kanji back then, didn’t you? Oh, so you were interested in Japanese language? The first time I came to Japan for that week, I thought, “You know, I’ve really got to study Japanese!” I bought a book at the airport on the way back and studied it all the time. Then the next time I came to Japan, I could write hiragana. Later, when he started working at Nintendo, I taught him Japanese and he taught me English. He said my English was weird. I asked him what was weird about it, and he said my prepositions were mixed up. So Miyamoto-san spoke English and Dylan-san, you spoke Japanese? I suppose that was the best way to study. Yeah! (laughs) But that was fun. Thanks to that, I was able to study a lot about Japanese culture.